Core principle of any Infrastructure design is “keep it simple”. Management of Identity Solution is never easy. Organizations around the world have different business / compliance requirements that make Active Directory Architecture “complex”. In this article we will see Active Directory Hybrid Deployment Architecture, Isolation, Security and Governance. You may have Applications that are accessed by Internal and External Users, Applications managed by different vendors and Applications that allow currency transactions. Each of these applications will need to be protected from attacks including Identity, and to reduce Blast radius of any attack. While Network and Application provide security at their layer, Active Directory or your Identity Management system may also play important role in securing the Infrastructure. Before we begin with possible Active Directory layouts, there is need to recall that primary purpose of Active Directory is Authentication and not Authorization. Authorization is provided by Applications. Of course, I have missed Azure Active Directory here. It will be covered later in this article. Now, why would you pick one over the other. The answer lies within your business requirements and what level of Isolation is required. In the diagram above, you have one Infra Forest that can manage your Production and Non-Production Forests. 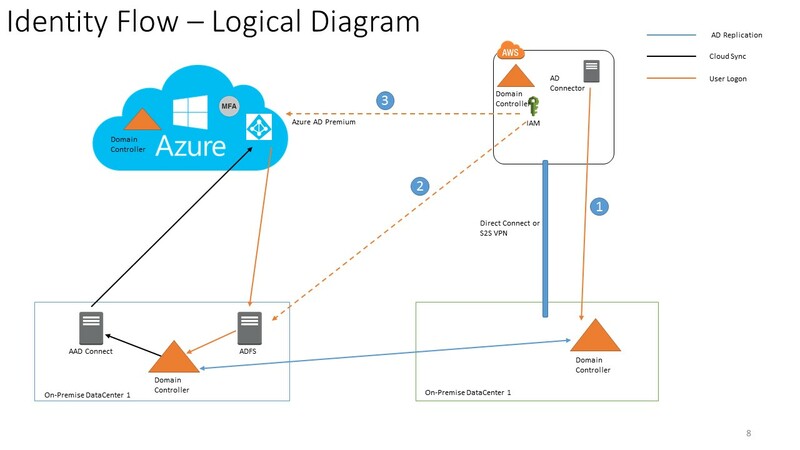 Now that Core-Foundation of Identity has been laid out, extend the Identity to Azure Active Directory using Azure AD Connect (not covered in this post). 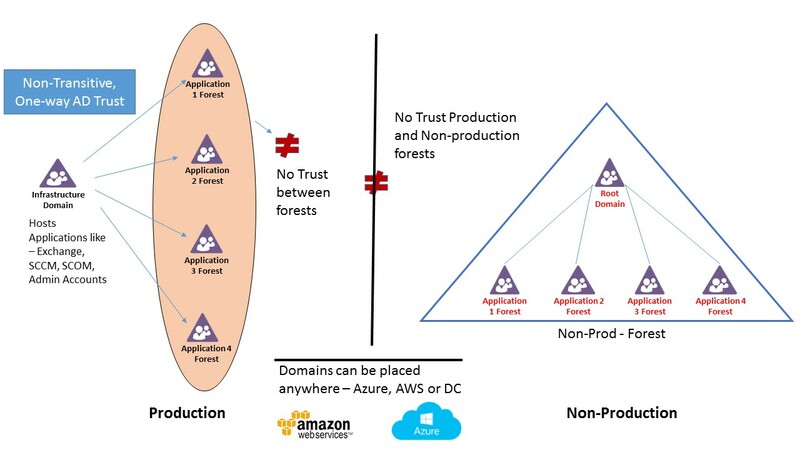 The domain Controllers or forests can be deployed from the above architecture either On-Premise and on the Cloud. The Diagram below shows various options of Azure and AWS IAM Logins, replication, Site Links, MFA and SSO Integrations. Now in Active Directory – Hybrid Deployment Architecture and Isolation , we will cover different areas where Security can be deployed to secure Applications, attack prevention and various tools that can be leveraged. Hope this post would help in making decision in laying out Active Directory Infrastructure and guide through Security and Logical flow in your design decision. Any questions, please feel free to write to me. Thank you.